November 2018: Ahead of Road Safety Week 2018, new analysis of the latest UK road casualty statistics (1) by LexisNexis Risk Solutions has revealed that the number of 17-19 year old drivers who have been killed or seriously injured in road traffic accidents has fallen by 35%, since 2011, compared to 16% for the driving population as a whole. 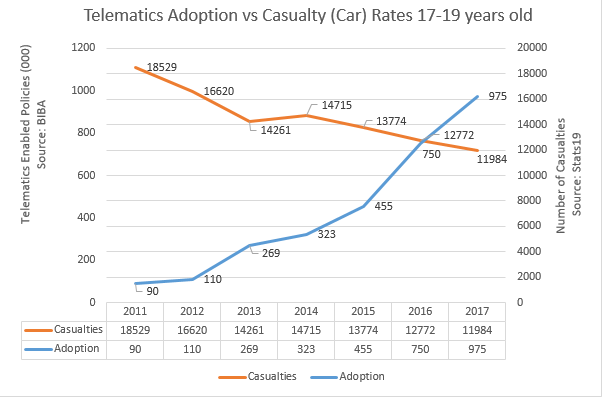 This marked reduction provides compelling evidence of the important role telematics insurance has played in cutting road casualties amongst the youngest most vulnerable drivers, helping to reduce casualties by over a third since 2011. The one major difference between young drivers and their older counterparts is telematics insurance, with 4 in 5 (2) young drivers estimated to have a telematics policy today. However, the significant reduction in young driver road casualties masks an increase in the rate of road casualties amongst the wider driving population (drivers aged 25-59) with road casualties up by 4% in 2017 vs 2016. 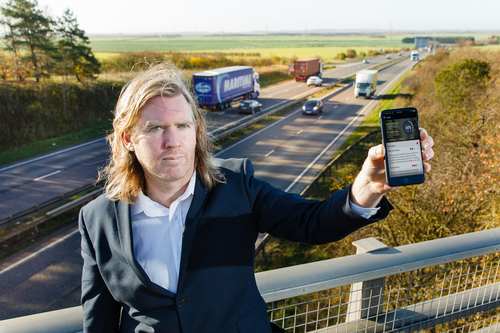 The analysis by LexisNexis Risk Solutions is the first time road casualty statistics have been studied in direct relation to the exponential growth in telematics policies (since 2011) with 975,000 (3) live policies in 2017, suggesting telematics insurance has done more to cut accident risk than any other road safety initiative aimed at the young driver market. The 35% reduction in road casualty rates in 17-19 year olds is despite the 10% increase in the number of vehicles on the road (2011-2016) and a 7% increase in the number of driving licences held across all ages (4) since 2012. Graham Gordon, Director, Global Telematics, LexisNexis Risk Solutions says; “Our analysis and interpretation of the publically available road casualty statistics factors for key road safety advances such as improved roads, better junction design and new car safety technology - but the patent downward trend in the 17-19 age bracket points to an additional factor at play, the increasing availability and adoption of telematics insurance. “Young drivers remain the riskiest drivers on our roads but the insurance sector deserves a great deal of credit for developing an insurance product that encourages safer driving and delivers fairer pricing to young drivers based on their road behaviour. “The analysis is exciting because it provides evidence that telematics has had a real impact on the safety of young drivers and the potential it therefore offers to improve road safety standards for all motorists . It comes at a time when the cost of offering telematics is falling dramatically for the insurance sector – we estimate by as much as 50% since 2013. At the same time, analysis of motor insurance premiums shows telematics policies frequently come out as some of the most competitive insurance policies (5) when consumers shop for cover. “It’s good to see that telematics are both giving young drivers access to insurance products designed to meet their needs and reducing the number of young drivers who become casualties. Future developments of this technology offer the potential to reduce casualties amongst other age groups, making a welcome contribution to our stagnated casualty reduction targets." •Road safety figures (Stats 19) have generally plateaued since 2011/2012. •In 2017, 1,793 people were killed on our roads, an average of 5 people every day and just under 25,000 people were seriously injured (8). •73 people a day are either killed or seriously injured on our roads. Last year’s annual total was the highest since 2011(9). •There has been a 6% increase in the number of deaths on motorways(11). •Car accidents are the biggest killer of teenagers, according to WHO(12). •Drivers aged 17 to 24 currently make up only 7% of drivers, but they represent nearly 20% of the people killed or seriously injured in car crashes(13). •The 18-25 year old age group make up close to 25% of all motor insurance claims and the average claim amongst the youngest drivers is £4625, which is double that for drivers aged 51 to 70(14). •In 2012, amongst 17-19 year olds, for every 37 drivers there was a casualty. In 2017 this increased to 1 in every 48 young drivers – a 29% improvement(15). •The Government estimate that road traffic collisions cost the UK economy in excess of £16.3 billion a year(16). •The Road Safety Foundation’s ‘Getting back on track’ report puts the societal cost of road traffic crashes at £35 billion in 2017. This equates to more than we spend every year on GP services and primary schools in combination(17). This press release was distributed by ResponseSource Press Release Wire on behalf of Harrison Sadler in the following categories: Motoring, Transport & Logistics, for more information visit https://pressreleasewire.responsesource.com/about. HSL is a dynamic marketing communications agency based in West London, established in 1987.